« How will virtual reality change your mind’s consciousness? [Thank you to everyone who joined us for PRESENCE 2018 last week in Prague, either in person or virtually. Special thanks to organizing committee members SongYi (Grace) Lee, Kun Xu, Hocheol Yang and Jihyun Kim. For me at least, it was another rewarding, intellectually invigorating and very enjoyable combination of presentations and informal discussions about different aspects of a fascinating topic. In our concluding session we identified a variety of challenges we face as presence scholars and we’ll be following up soon on some of the steps we developed towards addressing them. In the meantime, the story below is about how presence-evoking technology is being used in health care for animals. It’s from Veterinarian’s Money Digest, where the original includes a 2:02 minute video; for more information see the press release via PRWeb and a different video in coverage in Animal Pharm (both videos and a third are available on Vimeo). We usually think of telehealth as digitally connecting pet owners with veterinarians. But a new technology strives to make a digital educational connection between veterinary health care professionals. Telehealth is an increasingly important topic in veterinary medicine. And while it is most commonly thought of as a link between veterinary professionals and their clients, that notion may be broadening. Hodei Technology, a developer of mobile, real-time remote telepresence communication solutions, believes that telemedicine should also educate, enable and empower the entire veterinary team. Enter Aliquis Telepresence — a newly formed division of Hodei Technology focused exclusively on bringing a new teletechnology communications platform to the veterinary industry. 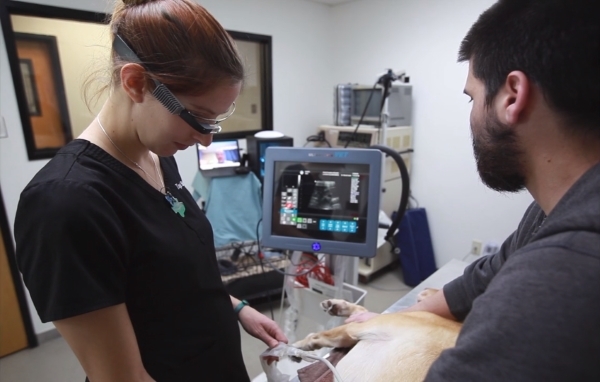 Aliquis Telepresence promises to enhance veterinary patient care by offering live, on-demand connectivity in virtually any setting. The company’s HCview GEMINI, currently available in the human medical market, features first-person point-of-view technology — made possible by its proprietary and patented Google Glass technology — that can link remote specialists with the front end of care. Aliquis Telepresence President Brian Huber, DVM, ABVP, said this HIPAA-compliant, real-time two-way audiovisual collaboration tool can be used to bridge the educational gap between general veterinary practitioners and specialists. “We see tremendous potential for telepresence in the veterinary space,” Mascaro said.